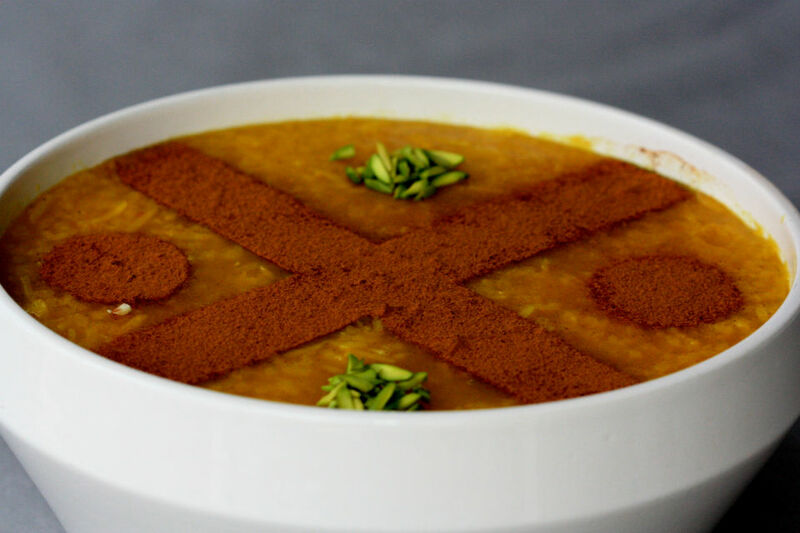 Sholeh zard – rice, saffron & almond pudding is an aromatic and delicious traditional dessert that can be made all year round. 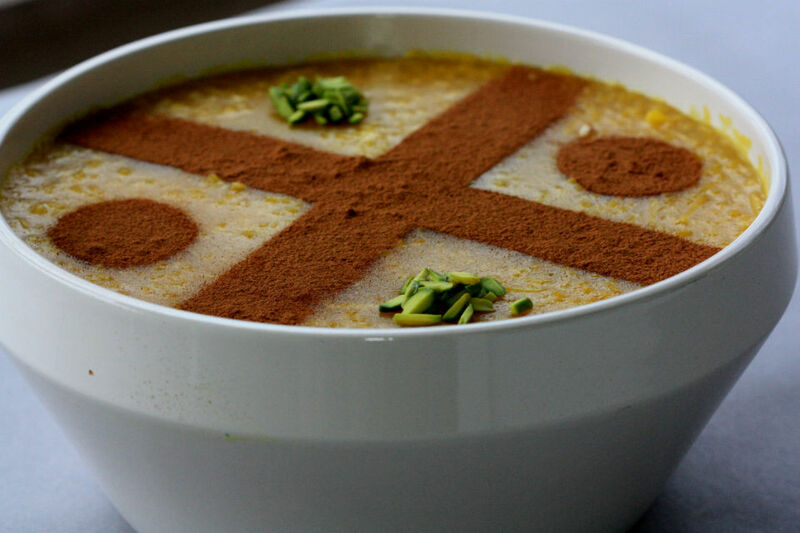 Sholeh Zard in Iran is made for all occasions. 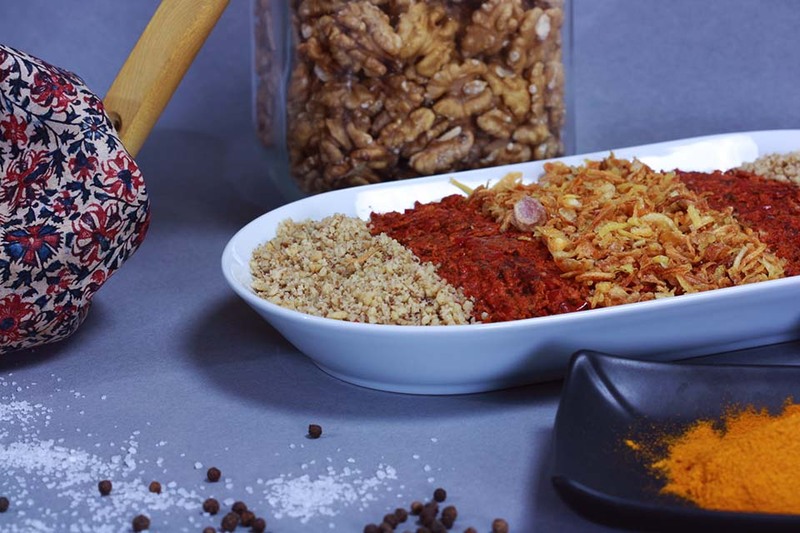 It forms an important part of the rituals of Shabe Yalda (Winter Solstice), the celebration that takes place on the longest night of the year and the commencement of Winter. Sholeh Zard is also made in large quantities on religious occasions and distributed to the public as a charitable gesture. 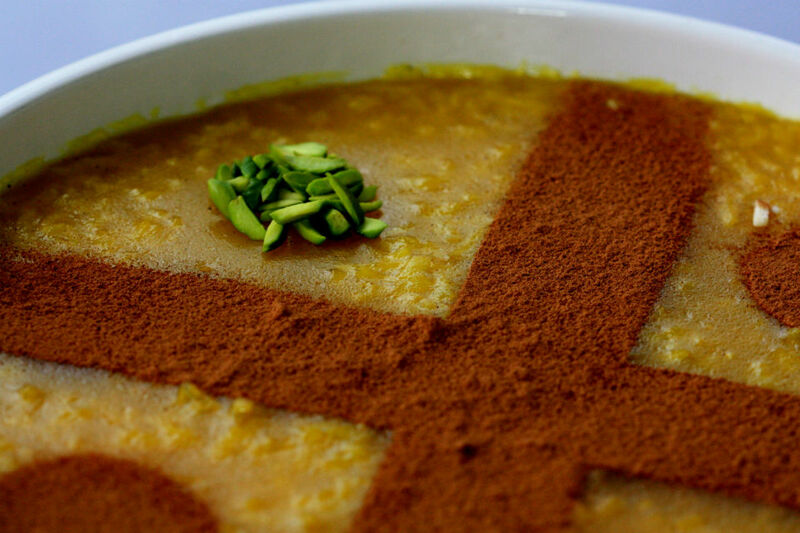 Sholeh Zard is a delicous Persian dessert delicate and light in texture, mild in sweetness; derives its golden hue from saffron the king of spices. It can be served in individual dessert goblets or in a large bowl usually garnished with designs made with ground cinnamon and slivered pistachios and/or almonds. 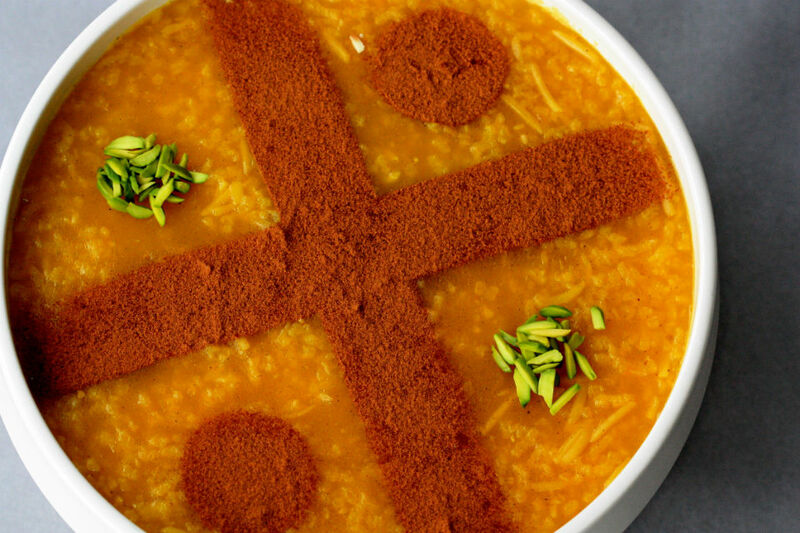 Even though it’s a rice pudding; Saffron is the key ingredient in Sholeh Zard; there is no substitute for saffron in this particular dessert. It derives its hue and a great deal of its flavor from saffron. 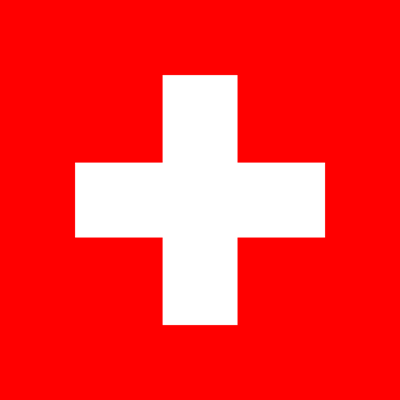 Having said that, one must be careful about the amount of saffron used. Too little makes Sholeh Zard pale and weak in fragrance and flavor, on the other hand too much saffron can be overwhelming. Good saffron has wonderful fragrance, flavor, color and is repudiated for its aphrodisiacal properties. Persian cuisine prides itself on its various techniques of rice preparation but this is one of the rare occasions where Persians consume their rice cooked so much that it actually loses its form and becomes a paste. Rice puddings are usually made with milk. 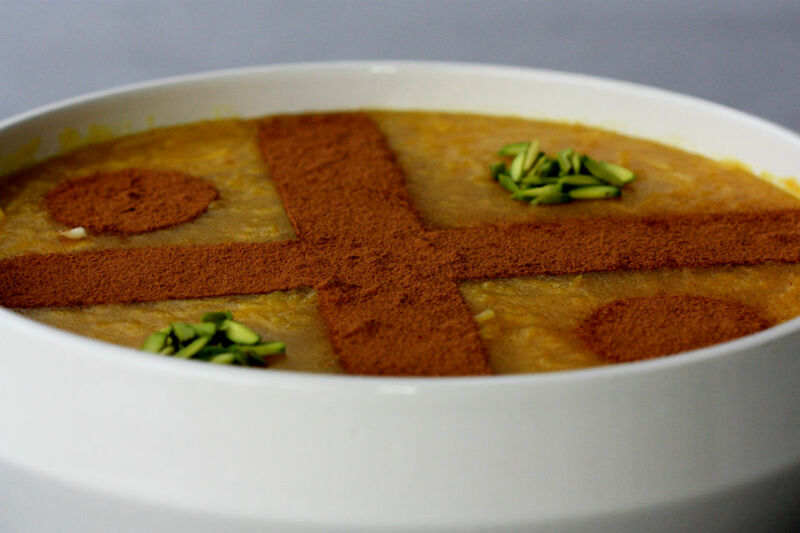 Sholeh Zard on the other hand is dairy free perfect for those of you are who are lactose intolerant or vegan, this is a dessert just for you!